Spirits inhabit every piece of the Earth in Newford. Some, like the cousins, prefer the more open, untamed areas like the woods or the Arizona desert. Others, like hobs, have no problem thriving in town, as long as the have a place to call home and a human or two to take care of. But humans have created an entirely new realm in the last few decades. The internet and 'cyberspace' may not physically exist in the same way that a forest or a city does, but spirits have always been the masters of the Otherworlds, and they tend to pop up where you least expect them. 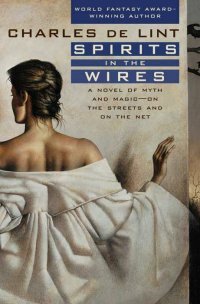 This is the situation that creates all sorts of trouble in Charles de Lint's 13th Newford book, Spirits in the Wires. We start out with two women with very different, yet similar, backgrounds. Christiana Tree is the shadow of the fantasy and paranormal author Christy. A shadow is the parts of one's personality that he casts off to fit in to society. Christiana came into being when Christie was seven, and from then on developed a life of her own. Where Christie is reserved, Christiana is outgoing. Where Christie is deliberate in his actions, Christiana acts rashly, relying on her gut instincts. She only revealed her existence to Christie relatively recently, and has a bad habit of reading his journals while he's asleep to get to know him better. Saskia also had an interesting origin. The website Wordwood was created by a group of book lovers who wanted to help people gain access to literature and information, but has seemingly gained a life of its own. A user can ask any question in its search bar, and the Wordwood will do its best to provide the information requested. An oddity of the site, though, is that it answers in the cadence of someone close to the user, usually a deceased relative or friend. Saskia's origins are a bit of a mystery, especially to her, but it seems as though she was spawned fully formed from the Wordwood itself. She simply woke up one morning, having a mind full of information, but no experiences to go with them. Eventually, she learns to get by in the consensual world, but she also gives up a large part of her strangeness to do it. Both of their lives collide one night shortly after they meet in a bar. A hacker is blackmailed into uploading a virus onto the Wordwood as a way to get back at Saskia by taking down her 'favorite' site. As the infection grows within the site portals open up through the monitor of peoples' computer screens, teleporting everyone using the site at that moment into the realm of the internet. Saskia is on the computer at Christie's house when this happens, and she is taken right in front of his eyes. Thankfully, Saskia's experiences so far have left her a bit more suited to an Otherworld kidnapping than the average internet user, and she is able to contact Christiana through the phone lines, eventually taking up residence inside Christiana's head. Eventually, two rescue parties are formed. One is led by Christiana and Saskia, and the other is led by Christie, Geordie and even the original blackmailer himself, a book reviewer named Aaran. The spirit in the machine idea has been explored many times, from Do Androids Dream of Electric Sheep to Ghost in the Shell. But the mixture that de Lint uses here, of traditional spirits moving into the cyber realm to me. The spirits he uses, such as a guardian of entryways seems perfect to inhabit a search engine such as the Wordwood. The take is classic de Lint and even in this strange new world of technology, familiar faces and themes make this a book for people of any technological aptitude.